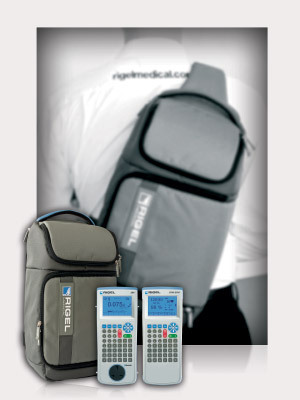 The new Rigel Medical Med-eKit Lite is a comprehensive vital signs testing kit in one easy-to-carry and convenient solution. Protected and transported from site-to-site within a new lightweight and water-repellent sling-style carry case, the vital signs kit features the 288 electrical safety analyser and the UNISIM vital sign simulator. The hand held 288 incorporates easy-to-follow menu driven instructions for operation and test control of all IEC 62353 and IEC 60601 required electrical safety tests in manual, semi automatic or fully automatic test modes. Featuring built-in automated testing, the portable UniSIM is the smallest simulator capable of undertaking six tests, enabling medical device engineers to quickly, easily and accurately undertake NIBP, SpO2, ECG, temperature, IBP and respiration functionality tests simultaneously using a single instrument. Med-eKit Lite is the most compact solutions available for testing the electrical safety and performance of vital signs monitors. Ease of portability allows the user to transport biomedical test equipment to any test location where all the test data can be downloaded into Med-eBase software for full traceability and data recording. Its versatility also means that it can be configured for different combinations of other Rigel instruments including for instance the 288 and the newly launched UNI-PULSE defibrillator analyser or the 288 and a hand-held ventilator tester. Visit the product page to read more about the Med-eKit vital signs testing kit or request a quote or demonstration.